Tonight saw the third hour of my client’s 10 hour course on Basic Western for Martial Arts Cross Training. The lesson had a strong emphasis on building responses and tactics. We also had a deeper look at the right hook and introduced the upper cut. We began with mirror footwork and working the jab. From here the fighter gave and parried jabs. We then worked slipping and straight rights. Here the idea was to get flow of attack and defence, using upper body mobility and footwork. With so much focus on these areas of movement, placing strikes becomes easier. The fighter does not obsess over a technique, let alone a combination. Instead they manoeuvre into effective positions and the right technique becomes almost instinctive, matching the right target. We then revised the four-punch combination. The right hook was worked as a counter technique. This is really where it works best in boxing. We covered the slip to the outside/right hook, the slip to the inside/right hook, the slap-down parry/right hook and the block/right hook. Then we mixed this in with other punches. Having isolated ducking, we then brought in the uppercut. This punch can be delivered in several different ways, but the way to learn first is as an extension of a ducking motion. As the fighter rises he unleashes his uppercut at the last moment. This punch was then built onto the combination, giving us the six-punch combination. My client was then introduced to his first round of sparring. This was followed by 2 x 1 minute rounds of punching from a lunge position (to encourage more leg recruitment and stability when punching) and then technique/speed/power burnout round. Another great resource, demonstrating experience and education in the use of the right hook. 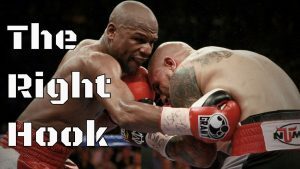 This article nicely describes five effective set-ups for the right hook.